It's fantastic to hold your book in your hands … and it's faintly fantastical to hold a book with your name on it when the interior is in a different language! Read German? Or please pass on to friends! You can also see Pentecost on LovelyBooks.de here. You can also read the interview in German on Tina's site here. Tina, what's your background in translation and language work? When I first started working, I was as a civil servant in my native country Germany, but this made me so unhappy that I decided to quit after a while. I studied linguistics and literature and I have now lived in London, England, for 13 years. Apart from literature I have translated film subtitles, web sites and various material. Other work has included magazine writing and sub-editing, audio work and teaching German. Can you explain how a translator actually translates the work? How do they keep the ‘voice' of the author as well as adapting to a new audience? In an ideal scenario the translator should be a native speaker who is translating into their own language and can relate to the voice of the author, especially when it comes to fiction. The original should be converted into a book that reads like a work in its own right and the readers are not supposed to notice straight away that they are reading a translation. There are hardly any publishing houses that let someone translate into a non-native language and it makes sense – not many translators can juggle the words in a foreign language in the same way as in their own, especially as you are dealing with another person‘s voice. Even though I have lived in the UK for a long time, I would never translate a novel into English. When you are reading a translation, you will inevitably not just notice the author’s voice, but also the voice of the translator, and if you ask two people to translate the same text, there will always be two different results. You cannot just translate word by word and translators often have to come up with their own creative solutions. An example from Pentecost: it is not as straightforward as you might think to translate the word “power” into German – there can be several different solutions or none will really fit in certain contexts. That’s why I chose to translate “power” as “mysteriöse Kräfte” in the Pentecost marketing text, which would be “mysterious powers” if you translate it back into English. Why did you want to do a royalty split deal with an indie author? What are your tips for translators who want to do this kind of thing? I used to translate fiction for German publishing houses, but I don’t do it anymore because it doesn’t pay my bills in an expensive city like London. In general, publishing houses pay very little for literary translations if you translate not into English but into another language. There is of course no guarantee how a royalty split will work out in the end, but I was interested in self publishing anyway and knew I could learn a lot from Joanna, who has so much experience. I met her at one of her own self publishing workshops and at first I did not even plan to do another book translation, but I decided to give it a go again, when Joanna told me she was looking for a German translator. My advice for translators who are interested in the split-royalty model is to choose books that are successful in the original and think about whether they would also appeal to another audience. It is also best if you like the content enough to do it even if the translation won’t be successful – there is no guarantee. And it will help if you have some knowledge of the self publishing market in the target language market or be interested in learning about it. You should be willing to do some marketing as well, which can be in various forms, for example blogging, social media, contacting book bloggers and anything else that helps selling the book. I believe the split-royalty model could be quite interesting for translators who are authors at the same time. It is said the more books you have out there the easier they will be found by readers – why not go for a hybrid model with your own as well as translated books? I am planning to do this myself. How should indie authors find a good translator for their book? How do they evaluate it when they don't speak the language? I would only consider translations if your book does already have many readers in your own language. Then you could look out for translators who have some experience with book translations, even better if it is in a similar area to the one of your book, but in my opinion the same area is not strictly necessary if the translators have a passion for what they are doing. One place to find translators would be proz.com and translatorscafe.com. And then there is the platform Babelcube.com that works with the split-royalty model, which some authors are now trying. None of the experienced German literary translators I talked to are that interested in Babelcube, mainly because the more successful the book gets, the less the translator‘s share as it decreases with sales. I suspect the majority of authors are not aware of the fact that the most important thing is not how well the translator speaks English, but above all they need to be really good at their own language and interpret the work well, although it is usually easier to translate non-fiction, unless it is a very specialized book, in which case the translator should have knowledge in this particular field. People can lose part of their language skills when living abroad and therefore it helps if translators make an effort to keep up to date with their language in that situation. It‘s easy for me, as there are many Germans in London to socialize with (you can actually find the whole world here, which is one of the reasons why I like this place so much). Translators who work for publishing houses often do not even have access to their authors, which means they are not able to work with them at all! I heard about an extreme case recently: when a literary translator friend of mine had no success in contacting an author via the publishing house, she left him a message on his website, but he still didn't answer. This author possibly had no idea how much can go wrong if he doesn't answer questions. Here is an example of a simple question I asked Joanna: in the book “Pentecost” the heroine has an assistant at Oxford University and unlike in English you have to make a decision in German whether it is a man or a woman (“Assistent” or “Assistentin”). If it is a series, as in this case, and the assistant is going to appear again in a future book, it doesn't look good if the translator gets the gender wrong. Unlike in traditional publishing, I am sure problems with questions will rather not happen in self publishing – translators and authors are probably in touch with each other anyway. What are some of the issues we have come up against? One of the issues we faced was the German hyphenation for the print book, which is different from English. You cannot just ignore this, as there are some incredibly long words in German. If you are planning a print edition, make sure you are using a formatting software that allows you to switch to German. Doing the hyphenation manually would be a real pain. And leave the hyphenation till the very end – any proofreading stages should be done before this – I made a mistake here myself. If both the translator and the author are using Scrivener, don‘t send Scrivener files back and forth. We had a real formatting mess with two different language settings and it probably didn‘t help that I am using a PC and Joanna a Mac. Therefore I would only exchange Word files and just one person, either the translator or the author, should convert everything from Scrivener to ebook formats in the end. Then there was the question which title to choose. Nowadays you will find a lot of book titles on the German market that contain both the original and the translation, although in this case the cover would have needed a complete reformatting with the longer title. The direct translation “Pfingsten” would have sounded a bit awkward in German, although at the end of the day this is all a matter of taste. 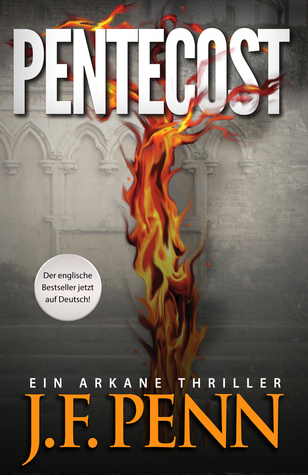 You can of course argue against keeping just the English, but it‘s a mysterious thriller after all and the additional “an ARKANE Thriller” was translated into “ein ARKANE Thriller.” Some readers have even been excited to figure out that “Pentecost”means “Pfingsten” in German. The longer title “Pentecost – ein Arkane Thriller” also made it safer in terms of copyright, as titles are copyrighted in Germany once they are published. We have marketing help as part of our agreement – is that important for a royalty split deal? I do not think it is essential, but if the author doesn’t speak the language I would advise to have at least someone who can read your reviews and tell you what is going on in self publishing in the market of the translation – things are changing so incredibly fast! There might also be differences in the other culture that are hard to grasp for someone who does not know the mentality. Here is an example: I was convinced that the latest cover of Pentecost in English (woman with a gun) that worked so well in the US would not be well received in Germany. My opinion was confirmed when early German readers had a chance to vote and choose between two covers before publication – hardly anyone liked the one with the armed woman. It was nice to be consulted on this, as normally the translator has no say at all when it comes to covers. If you are looking for help with marketing, there are other options than translators and the platform Authorbuddies.com aims to bring authors from different countries together to help each other. It was set up by German self publishing expert Matthias Matting and I am sure you will find German authors there (and maybe authors of other nationalities as well) who can help you out with specific marketing questions. Example of marketing – I made the trailer below in English and Tina translated the text. What are you enjoying about the process? And what is difficult? Learning a lot about self publishing and ebooks is the thing that I am enjoying most and it is also fun to work with Joanna. I found it a bit difficult to juggle my short term paid work with the long term self publishing projects, as I need to make a living, and unfortunately I was not able to finish the translation as fast as I would have liked to. But we still managed it all within a year. Another thing that I found tricky was to set up blogs and social media – which language should I choose for which angle? Even though many people in Germany can speak English nowadays – at least up to a certain level – being able to order a pizza and a beer doesn't mean readers are able or willing to read a book or blog in English. I think it may help to have at least one platform in the book's language. If you have any questions about self-publishing in translation, or anything about the German market, please leave a comment below. Thanks! I’m interested to know how you managed the royalty split. Is it 50-50, 60-40? Does the translator appear as co-author or are they simply mentioned as ‘translated by’ in the credits. Other people do the royalty split differently, e.g. BabelCube has a scale that changes over time, essentially paying the translators off first and then trailing their % off. I consider the translator to be a real partner and so want the split to be half and half. I manage this by setting up a Google spreadsheet and being transparent about sales and royalties and then I pay the translator. How the translator is credited depends on the country and the translator’s preference. I can think in German, but I cannot think like a German. I recognize the need for a native speaker to translate. How does Frau Tenneberg feel about working with writers who can read the translated work? BTW just bought Pentecost — the German edition. Look forward to reading it. It is great that you can even think in German 🙂 Depending on your written skills, there is also the possibility of translating the book yourself with a thorough edit by a native speaker. If you want to give it a try, I am happy to look at a sample. It might even allow you to keep more of your original voice. This model may also be interesting for people who are not English native speakers. I remember an editor who worked for an English publishing house saying one of the reasons why there are so few translations from other languages into English is the fact that many people can speak it well enough to read the translation and complain about the result as they feel it is not their voice anymore. Translating myself? That’s a thought. But every hour I spend translating is an hour I take from writing. Then there is Portuguese and Spanish. And I wonder what effect my accents will have on the translated product. I speak Mittelhochdeutsch, paulista Portuguese, and Tejano Spanish. I think I prefer to contract for the translation. I can read the translation and discuss phrasing and translation of idioms with the translator. For instance, I read a story written in English by a German. The writer described the volume of the Zeppelin airship in the story in terms of millions of gallons. Gallons is the translation from liters, but it does not work. In English, in the time of the setting of the story, the term used for gas volume was cubic feet. As an example, the Luftschiff Hindenburg’s volume was 7,062,000 cubic feet. Giving the volume in liters is an error in translation. I would make similar errors translating to German. For that reason and because my time is better spent writing than translating, I choose to contract for translation services. You have a good point, Antares, if you think your time is better spent writing than translating. And you are right, most readers would not want or be able to read the old German Mittelhochdeutsch. As for the possible mistakes you are mentioning, however, a good editor could help with those. No one is perfect, not even an experienced native speaker of the language, and an editor is always recommended. Inge Wehrmann was a very good editor for the German Pentecost translation, by the way. Really appreciate your helpful reply Tina, it makes sense to do 50-50. It sounds very much like TRUST is what makes this work, so choosing the right person is critical. Are you more likely to choose your translator to do the audio version because they already have a heart for your book, or would that depend on their speaking voice? Many thanks for your nice feedback, Amy! I am always interested in hearing the translators’ point of view. Germany seems to be the most active non-English speaking country at the moment, when it comes to self-publishing, but I am sure there will be more potential in other territories as well in future. I believe that translators can play a far more active and visible role in this than they have so far and I have written about it on my blog here: http://internationalselfpublishing.com/the-role-of-translators/ You seem to be quite proactive as a translator, which is great. I am definitely going to write more about this topic in future. And the link to the emerging literary translators is certainly interesting for translators who are starting out and authors who would like to work with them. Really interesting read – thanks for this! I hadn’t even thought about being able to read the reviews later, so it definitely makes sense to work with the translator as a marketing partner as well. Thank you for this very interesting and helpful post, Joanna and Tina. I will definitely be thinking about German translation in the future because I have a novel, Oranges for Christmas, which is set in Berlin in 1961 at the time of the building of the Berlin Wall. Although the novel is in English, I included a bit of German speech (always translated into English) just to give the novel more of a German flavour. Although I have a degree in German, I recognise that translating my own novel into German is way beyond my capabilities. You’re absolutely right, Tina, that the translator needs to be a native speaker. Fantastic article! This is really the type of content that we in the translation community don’t see very often, especially when it comes to self-publishing. I translate from French to English, and aside from a couple of literary translations I’ve had published this year, finding indie authors in Quebec and France isn’t easy and finding popular books that would work in English isn’t easy either. But we carry on! It’s such a worthy pursuit. Another source for exclusively literary translators is the Emerging Literary Translators’ Network in North America run by Allison Charette. http://charettetranslations.com/ There are people working in many different language pairs. ProZ and Translators Cafe can be a source of course, but there are a ton of people on those sites, so you can narrow things down a bit contacting people with more of a literary background than other types of translation backgrounds. Great to hear about translation endeavours! Danke schoen Tina, und ich hoffe dass wir mehr ueber dieses Thema hoeren werden. I totally agree with Antares – speaking and reading the language is one thing and thinking and knowing the nuances of it is completely other thing. I prefer calling it “50 shades of a language”. When I was teenager I was learning German very intensively and was able to write essays in German but with time I stopped and now my German is not that good as it was. However, my mother is a German teacher and she is a friend with a native German speaker. When I was speaking with my mother asking her whether she can translate my novel into German, she replayed she can but a native speaker must edit it after her. That backs up Tina’s statement. I belong to a very small country and wrote my novel in Bulgarian and continue to write my other works in my native language. At the beginning I tried translating it myself, but I felt, my writing got worse. The advantage of knowing English is that authors can have more control with the translation and are more involved in it. In my novels all the scenes take place in New York, London and/or Los Angeles. I am working my butts off to find a good translator. It seems, I have two options: to hire a Bulgarian translator and then hire a native editor or directly to hire a native translator who would polish the translation. Obviously the latter option would be more expensive. I also consider testing each translator before hiring one as a lot of material would be involved in the process. Once the native translator finished the work, is there a need for editing too? What would you advice me, Joanna: hiring directly a native translator or a non-native one and then a native editor? I am no big name, in short time I will publish my début story and won’t be able to do 50/50 split. Moreover, I don’t want it as I’ll get much less than otherwise. Hi Antara, as it happens I published the article “5 reasons why self-publishing could help to get more books translated into English” on my blog internationalselfpublishing.com this morning and I mentioned Bulgarian as an example for a smaller language, without knowing you would comment here on Joanna’s blog today! I do admit it is more difficult for smaller languages to get translated, but not impossible. As you speak German and are interested in a translation into German as well, you could also have a look at the website literaturuebersetzer.de There are two people listed who translate from Bulgarian into German and the organization is planning to do a German-Bulgarian translators’ workshop in November, so maybe there are more potential translators out there. By the way – even if you are using a translator, I would recommend working with an editor as well, if possible. And in case I can help you with any other questions, please don’t hesitate and contact me. Good luck! Thank you Tina for your kind words and wishes. I do plan (maybe) one day to translate my novels in German but I was speaking about Bulgarian-English translation. I am aware I didn’t mention the targeted language and the proper translation. As for German, I have the privilege my mother to be a German teacher in a university but now she is pretty busy. We are friends also with a retired German native teacher who happens to live in Bulgaria, she even taught me German when I was a schoolgirl. Maybe it’s not your area of experience but if you know any Bulgarians out there in UK who translate from Bulgarian into German, feel free to give me their names. So, you think even if a native speaker translates the text, an editor is still in demand? maybe the same person should edit the text as well. Dear Antara, as for your question about editors – I would definitely advise working with at least a second pair of eyes. Please consider this: If the translation turns out to be poor, you are lucky if readers recognize this. All books are normally read like originals and readers may call it a bad book, not a bad translation, they might even think you are a bad author. I personally would not risk this. I don’t know any Bulgarian-German translator here in London, but someone who used to translate English-Bulgarian and vice versa, although I haven’t been in touch for a while and I think she doesn’t even do translations anymore – I will try to find out. I’m wondering about the issue of (Scots) dialect in an English language book and if that would pose an additional problem in translation. My novel is set in the 16th century and I have used primarily word order (+ some Scots vocabulary) to reflect the cadences of the period, and wondered if that would be problematic also? It’s probably a question for the translator, Margaret. They will make decisions around what words to use. I wouldn’t say it is a problem, but something will be lost in translation. It would sound very strange if it was translated into a regional dialect in the translated language. One possibility is to make it sound a bit more colloquial than the rest of the text and/or come up with a creative solution to give it a Scottish flavour, depending on the text. That’s an incredibly great article! I am german freelance translator at 2polyglot.com so that was really useful! Hello, I want to know more about German language translation and you have no problem to share with me. The information you shared in this blog is awesome and I think you can rewrite or update this blog I suggest you as a user point of view. Great information but need to update the blog…! !